The ability to hear sounds is one of the biggest endowments God has given us. But some people don’t have this ability to the fullest – and the reasons are out of the scope of this writing. Thanks to advancements in medical technologies, however, people suffering from moderate to profound sensorineural hearing loss are now able to have their hearing restored with cochlear implants. That said, the astronomical cost of cochlear implants in many countries is a major discouragement for many. Not to worry. 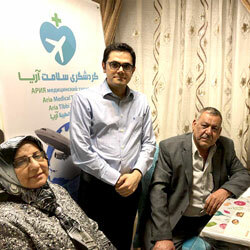 We help you get the most affordable cochlear implants in Iran at modern hospitals. Contact us for more by filling out the above form. Sound waves travel through the ear canal and reach the cochlea via the middle ear. In the cochlea the sound wave is transformed into electrical pulses which travel down the nerves to the brain, then the sound is processed. the cochlea plays an important role in the hearing ability. It consists of three little channels filled with fluid. The incoming sound wave travels through the fluid and stimulates thousands of hairs on the top of the hair cells. Then the hair cells convert the mechanical energy into electrical impulses which stimulate the nerve fibers. When the hair cells are partially absent or damaged, hearing is impaired. This condition can be helped with conventional hearing aids. when the hair cells are completely absent or damaged a severe to profound hearing loss occurs, usually the nerve fibers are intact but they cannot receive electrical impulses. In this condition, cochlear implants can help. 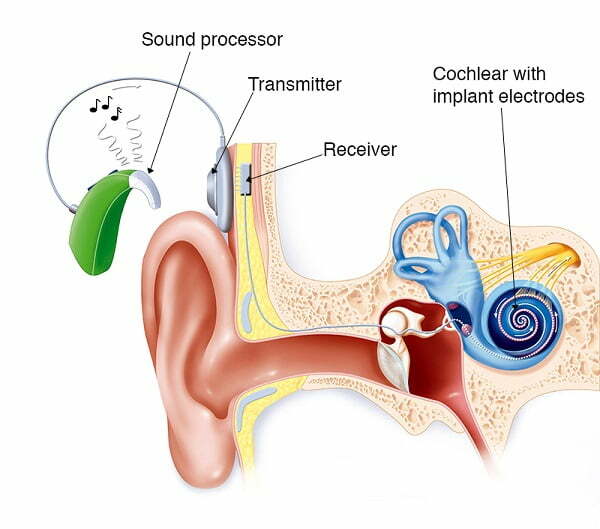 How a cochlear implant device functions? The surgeon inserts the electrode into the cochlea as deeply as possible. He places the implant under the skin behind the ear. The external transmitter fits exactly over the internal implant. 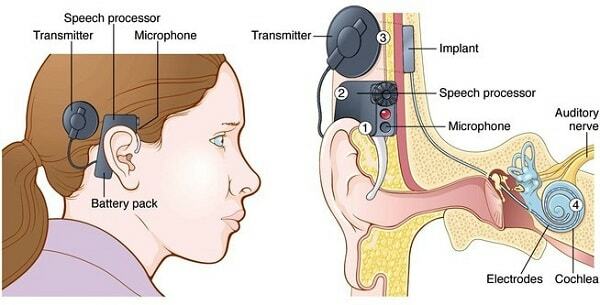 The sound is transmitted through the skin, the microphone picks up the sound and sends it to a small computer (the speech processor). the speech processor transforms the incoming sound and sends it through the intact skin to the electrode array. Speech and sounds are transmitted to the hearing nerve artificially. There are two nerves running behind the ear (facial nerve and taste nerve). The facial nerve supplies all the muscles of the face on that side that enable the person to close eyes, to smile or to raise the eyebrows and the taste nerve. There is a small risk of damage to these nerves behind the ear during the operation. If the facial nerve is damaged, it can cause weakness of the muscles. Although this risk is very small, it is important that the patient be warned about it. To monitor this nerve during the operation, some tiny needles are put into the face one at the corner of the mouth and one just above the eye. When these needles are taken out, it can lead to some bruising which usually settles over a week or so. Accessing the cochlea can be difficult, if the narrow gap between the facial nerve and the taste nerve be so small that makes it hard for the surgeon to get through, then sometimes the taste nerve is damaged or bruised. That damage would result in an abnormal taste sensation on the tongue on the side of the operation towards the front of the tongue. That will resolve and settle down but it can take a few months. Many patients who had their first implant more than years ago and they’re still getting benefit from it. The patient is looked after during the surgery by the anesthesia team. This involves having a small tube placed through the patient’s mouth and into the patient’s windpipe, so he or she can breathe while asleep. A brief sore throat for a few days after the operation in some patients might occur but it is because of the breathing tube. After the surgery, there will be a scar behind the ear but it heals very well and usually, after about a year it will be barely visible. first of all, the patient needs to go through a full assessment. This involves a number of appointments and discussions. If the surgeon concludes that a cochlear implantation is a better option for the patient than the conventional hearing aids, then in the stage, it is important that the patient get vaccinated against meningitis before surgery. The cochlea is close to the brain and therefore, there’s a very slightly increased risk of meningitis after the operation. to minimize this risk, the patient is asked to have the vaccination at least a week before the surgery. Also, the patient general health is checked prior to the surgery. The patient also is asked to fill out and sign a consent form about the risks and the benefits of the surgery, so that there will be a formal agreement to proceed with the operation. The operation is typically performed under general anesthesia. The anesthesiologists will put the patient off to sleep, so the patient does not feel any pain. it is important that the patient fast before the surgery and the patient be given adequate instructions as to when to stop eating and drinking. Depending on the patient and the anatomy, the operation can take anything from one and a half to three hours for each ear. Then the area behind the patient’s ear is prepared by shaving some of the hair. This is so to keep the area as sterile as possible. when everything is ready, a cut is made through the skin and the soft tissues. once the bone behind the ear is exposed the surgeon go through that bone to access the middle ear in the cochlea to access the middle ear space. Then the cochlear implant device is placed behind the ear through a small surgical incision. It’s composed of a small device that sits underneath the skin. It sits against the bone behind the ear. The surgeon has to go between the facial and the taste nerves to access the cochlea. Then a small opening is placed into the cochlea and an electrode is inserted very carefully into the cochlea (a small wire about two centimeters in length). Once the surgeon places the internal component of the cochlear implants underneath the skin and into the cochlea, he/she sutures up the skin behind the ear. Immediately after the operation, because of disturbance of the inner ear from inserting the implant or sometimes having a reaction to the anesthetic drugs, the patient might feel dizzy and may have an unbalanced feeling. Either way, the patient can be given medicines that help reduce nausea and the sickness feeling. Usually, over a few days, this will all settle down and the patient will feel back to normal. Tinnitus is a noise in the ears that some people experience. If the person has never had tinnitus before, he or she may experience it after the operation. Usually, it settles over a few days and sometimes when the implant is switched on, it goes away completely. There is a small risk of infection for which the patient is given antibiotics through the drip during the operation whilst he or she is asleep. sometimes the patient is also given a couple more doses after the surgery whilst the patient is still in the hospital. Occasionally the patient is given oral antibiotics to go home with. ENT specialty has developed very quickly in Iran over the past several years. Iran is the first country in Asia and one of the first countries in the world that uses the most advanced technologies in ear treatment surgeries. 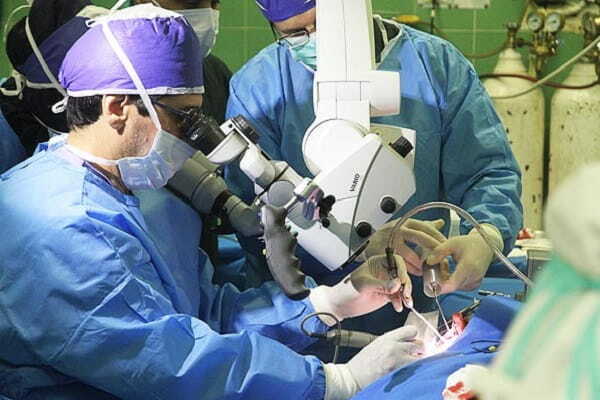 Currently, 11 medical centers in Iran offer cochlear implant surgeries. 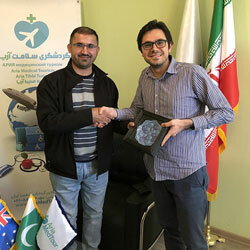 With its highly-experienced ENT specialists and modern hospitals, Iran is currently very active in cochlear implantation; (It is estimated that some 1500 cochlear implants are currently being performed in Iran). Obviously, the decline in the cost of cochlear implantation surgery in Iran is also an important factor for foreign patients who want to have such surgery abroad. There are factors that contribute to the ultimate price of a cochlear implant surgery including the quality of the implanted devices, the experience of the surgeon, the number of days that the patient stays and is monitored in the hospital and finally the cost of pre-op tests that are conducted before the surgery. 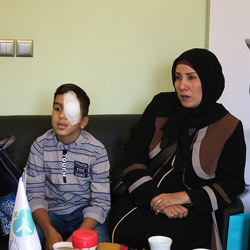 The cost of a cochlear implant surgery in Iran starts from $5000 which is greatly lower than that of a similar procedure in Europe, Turkey, and the neighboring Arab countries. The cost of a cochlear implant surgery in Australia can sometimes reach up to 30,000 Australian dollars. 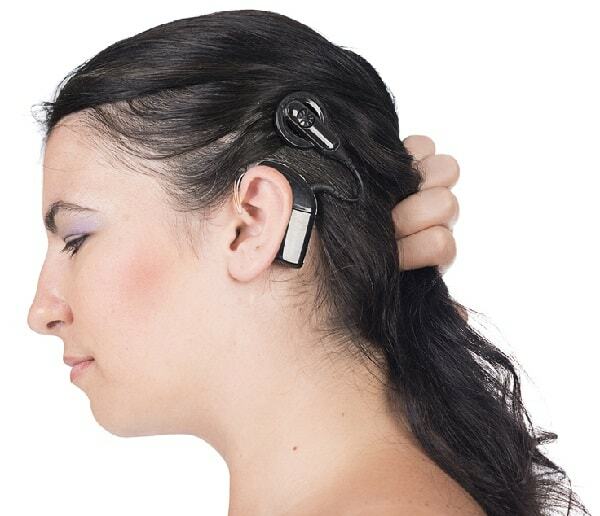 In the U.S., the cost of cochlear implantation can cost up to $50,000. For this reason, each year many patients from these countries travel to Iran to benefit from affordable prices of cochlear implant surgeries.